These beautiful, hand-turned Acacia baguette serving tray with candles by Pacific Merchants will look great on your dining room table brimming with chips, gravy, or condiments. Our acaciawood products are the essence of fine decoration and function. 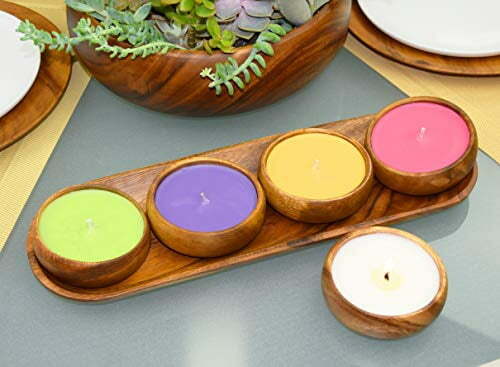 Whether your Acaciaware® products are functional or decorative, everyone can appreciate the unique look and feel of natural solid hardwood serveware. Acaciaware® by Pacific Merchants Trading Company is the original eco-friendly acacia hardwood, and is responsibly forested with care. Acacia wood is naturally resinous, resisting penetration by liquids and the hardwood will not stain or pick up odors. All of Pacific Merchants Acaciaware® acacia wood bowls are hand turned and our other acacia wood items like our acacia wood salad plates, pasta bowls or other acacia wood specialty items like baguette bread trays and dipping bowls are hand carved, giving each piece a unique grain and beautiful look. Pacific Merchants offers handcrafted wooden salad bowls, from large serving bowls to individuals salad bowls. We also offer a great selection of acacia wood bowl sets. Even our packing material is eco-friendly, made from recycled shredded cardboard boxes! Acaciaware® is easy care! Just hand wash with warm soapy water and air dry. Acacia Wood Baguette/Bread Tray, 16.5" x 5.5" x 1"